WEST PALM BEACH, Fla., Oct. 15, 2015 — 1 out of 4 children in South Florida have no idea where their next meal is coming from. 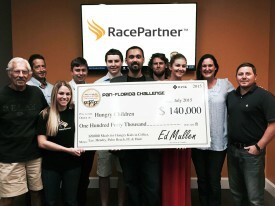 For RacePartner™ client Pan-Florida Challenge (PFC), the solution to this epidemic is one meal at a time. The 2nd annual PFC raised $140,000, which combined with donations from Meals of Hope, Feed my Starving Children and the Wal-Mart Foundation, provided 672,000 meals to hungry children in Florida and Haiti. PFC’s success illustrates how nonprofits can use applied research to create a successful event that not only raises money for a great cause, but creates lifelong advocates for the organization. Registration is now underway for the 3rd Annual PFC that takes place over two days, Saturday, March 12 and Sunday, March 13. The ride begins in Naples and finishes in West Palm Beach. Riders are asked to raise a minimum of $1,500, all of which will be used to purchase meals for hungry kids. PFC’s 2016 goal is to provide 500,000 meals to hungry children in Florida and Haiti. For more information on how you can make an impact please visit PanFloridaChallenge.org or contact Maura Plante at (561) 877-0732. Naples, FL based Pan-Florida Challenge (PFC) is a nonprofit corporation and the Pan-Florida Challenge for Hungry Kids event is an annual, two day, 160 mile bike ride across Florida from Naples to Palm Beach, held in March. Through our fundraising and partnerships, we provide meals to hungry children who do not know where their next meal is coming from. Our goal is for 100% of riders’ donations to go towards feeding hungry kids. Pan-Florida Challenge donations are tax deductible.